The Garmin GTU 10 is a relatively small GPS tracking device that features positional data delivery via quad-band GSM/GPRS technology. This gives it the capability of not only reporting where the device is located, but also where it's been. 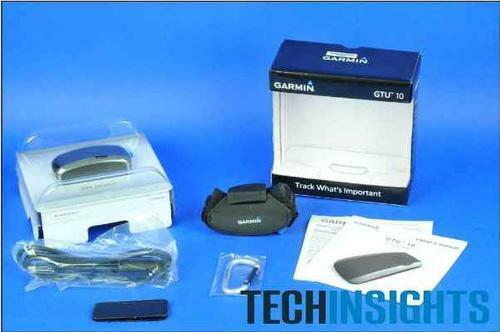 Taking a look at the full packaging of the Garmin GTU 10. The GTU 10 has several alert scenarios that the user can set up online from any computer or mobile handset with Internet access. In terms of power consumption, the GTU 10 can operate up to seven days in normal mode or up to four weeks, depending on the alert setting. With a retail price of approximately $199, which includes a one-year subscription, the GTU 10 finds itself at a similar price point with other Garmin GPS products, but it is marketed toward consumers wanting to keep track of pets, children, teenagers with the family car, and elderly parents. Taking a look at the design of the Garmin GTU 10, the first thing you notice is the compact design made possible by the ever-shrinking component set associated with both cellular data and GPS receivers. The GTU 10 also takes advantage of a modestly sized battery pack (a 3.7V Lithium-ion/Li-polymer battery) to provide a potentially long battery life. For the GTU 10, Garmin chose to use a predesigned quad-band/GPRS module from Telit to relay positional data to the network. The module, with part number GE865-QUAD, utilizes Intel’s single-chip quad-band GSM/GPRS baseband processor (the XGold-102/PMB7890) along with an RF Micro Devices’ RF7115 quad-band GSM power amplifier. All front-end Tx-Rx switching is incorporated within the module. Memory support comes from a Micron multi-chip package (MCP) believed to be the Micron M36W0R6040U6 containing 8MB of NOR Flash and 2MB of p-SRAM. The GE865-QUAD module is a BGA format and is placed directly on the GTU 10’s main PCB. Also found on the main board is an Infineon BGM781N11 GPS front-end module that interfaces with a MediaTek M3329T package. This MCP from the Taiwanese semiconductor manufacturer contains both a monolithic GPS receiver/baseband and a standalone NOR Flash memory chip. Monitoring and charging of the battery are handled by Maxim’s DS2782 standalone fuel gauge IC and STMicroelectronic’s L6924D battery charger system with integrated power switch for Li-ion/Li-polymer solution. STMicroelectronics also provides the STMPE801 (an eight-bit expander) and the M41T66 (a serial real-time clock). Form factor-wise, the GTU 10 is a very compact module, measuring about half the size of a small chocolate bar -- approximately 3 inches by 1.3 inches with a depth of 0.8 inches -- making it easily portable for tracking anywhere from inside your gym bag to the collar of your dog. A software application for Android or iOS-based smartphones makes tracking easier. However, the standard tracking service involves a yearly renewal fee. As a special bonus to readers of Design News, UBM TechInsights is offering a special discount of 30% off the Garmin GTU-10 Full Product Teardown Report. Just enter the Promotional Code of DNNOV2011. Offer good until Dec. 31, 2011. Slideshow: Apple iPhone 4S Teardown. HP TouchPad Tablet Teardown is posted here. Samsung Galaxy Teardown from DesignCon is posted here. UBM TechInsights' complete teardown report on the Garmin GTU 10 can be purchased here. Information on all of UBM TechInsights' personal electronics teardowns can be accessed here. Information on UBM TechInsights' subscription service for tablet product teardowns can be accessed here.